How glamorous are the lives of those who design our buildings? If The Architect is anything to go by there is much more to the profession than meets the eye. Beautiful women, signature buildings and an excess of alcohol feature regularly in the life of Rob Gilbert, the book’s main character. Most of the architects that I know aren’t shy of the odd refreshment but Gilbert operates in a permanent state of intoxication. Perhaps that’s how Frank Gehry came up with his designs for the King Alfred (though that doesn’t explain those in Planning who approved them). It is true that architects are fascinating creatures. I’ve noticed locally that there is a kind of uniform amongst them and it usually involves some kind of black jumper (like an Apple employee). Those who wear glasses go designer. But their clients – often rich and powerful – are just as interesting too and this is where it all falls apart for Gilbert. He gets involved with the wrong Russian gangster. And one of his buildings falls down killing people. I rarely find time to read these days, and it wasn’t my intention to read The Architect so quickly, but once I started, I had to get to the end. The story could easily fit around any prestigious line of work but I’m glad that architecture was chosen. It’s hard to imagine how tendering processes and concrete strength tests could be made so interesting but somehow Bancroft manages it. The author, Charles Bancroft, was born and bred in Brighton and that’s where much of the book was written. Its cover was designed by Brighton designer Annabel Tarrant. Brighton didn’t get a mention within though but hopefully that will be rectified in the forthcoming sequel, The Masterplan. 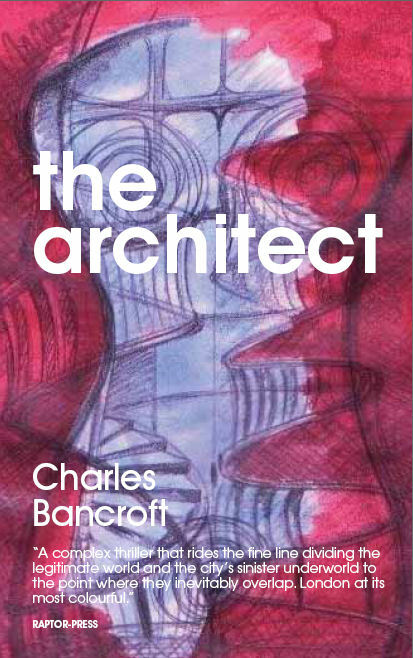 The Architect is available now from most good bookshops.